The Shelby GT350 has captured the automotive world’s attention and interest and continues to do so with each new video released of it. Just last year we were speculating on the GT350’s existence and now we are growing anxious for its much anticipated release! 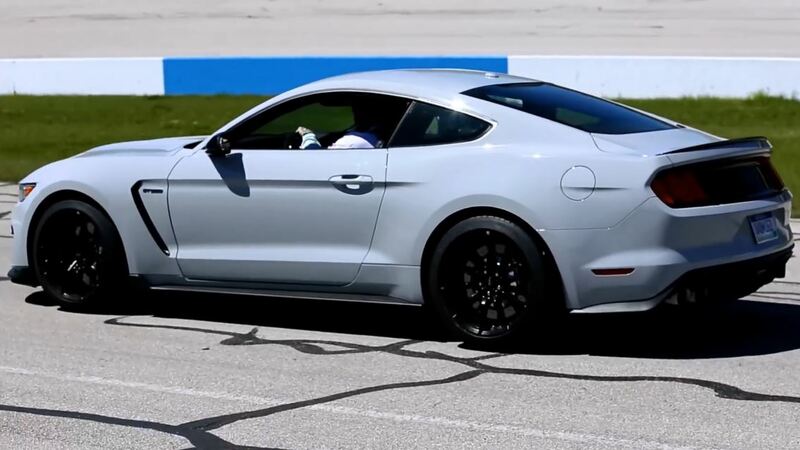 New videos of the GT350 have popped up from an event at the Texas World Speedway showing a walk-around of the newest Shelby as well as some good exhaust clips of the 5.2L flat-plane crank Voodoo Motor revving. This was the first public viewing of the GT350 that was not an autoshow, which means we are only drawing closer to seeing it on the roads! Initially popping up on Mustang6g, we got specific info from Shelby/Boss brand manager, Jim Owens, answering some of our biggest questions! Speaking candidly, yet carefully, Jim Owens shed some light on the Shelby’s projected power numbers. Jim said the the S550 Shelby GT350 will generate at least “above 100 HP per liter” which means that the GT350 will be packing 520+ naturally aspirated horsepower. Jim also added that the GT350 dyno’d “well north of 500” which raises the question of how north of 500 HP does it go? Reps from Ford have previously stated that the new Shelby Mustang’s Voodoo Engine is the most powerful naturally aspirated engine to come from the blue oval. Also raising more than a few eyebrows is the Shelby’s ludicrous red line which will come in at an astronomical 8250 RPMs. Heavily debated since early rumors first emerged, the Shelby’s flat-plane crankshaft has made it possible for the 5.2L engine to ring out its power band into the highest of RPM ranges. Coming as a surprise to almost no one, the SVT Shelby GT350 will be produced in fairly low numbers. Jim Owens commented that “it would be safe to say it would be somewhere between the Boss 302 number and the current GT500 number and I wouldn’t be surprised if the R might be akin to … the Leguna Seca version.” Ford has yet to officially state what the production numbers will be, but from the sounds of it they will be low making this GT350 even more collectable than previously thought. When Will The GT350 Go On Sale? Jim Owens answered one of the biggest and longest lingering questions about the GT350 stating that it would be available for purchase “earlier in the fourth quarter.” That aside, adding to the ever evolving mystery of Ford’s newest SVT Shelby vehicle they have not stated what model year it will fall into. “We haven’t divulged the model year yet and there is a reason for that.” One can assume that they have not release a model year yet due to racing reasons, but we will just have to just wait to find out for sure! How Much Will The GT350 Cost? The big elephant in the proverbial room is how much is the Shelby GT350 going to cost? Without giving a definitive answer, Jim Owens did give us a hint as what to expect price wise. Jim said that it will be a “relative performance value… not saying it will be cheap” however “it will have things in the car that you can’t get at any price.” A pricing proposal was to be presented to the group vice president on April 2nd, but there has still not been any public confirmation of cost. Given the prices of previous speciality Mustang, it is a safe bet that pricing will likely be $50k+, even possibly in the mid-$60’s range, given all of the new technology as well as the research and development that went into it. The GT350’s competitor, the Chevrolet Camaro Z/28, comes in just above $72,000 new. With that said, there is no promise as of yet that there won’t be dealer mark up on the new Shelby, but one can hope. What are your thoughts on the new GT350? Will it break the bank or will it come in as dollar per performance killer? Next Entry 2015 Shelby GT350R & GT350 Production & Pricing Numbers Released! Dealers will price gouge our f’n eyes out. I wish Ford would make it so they couldn’t.